Olive Garden famously claims that when you're there, you're family. But that distinction evidently has its limits, considering a man was arrested outside the popular Italian restaurant chain earlier this week for belligerently eating pasta and harassing customers. 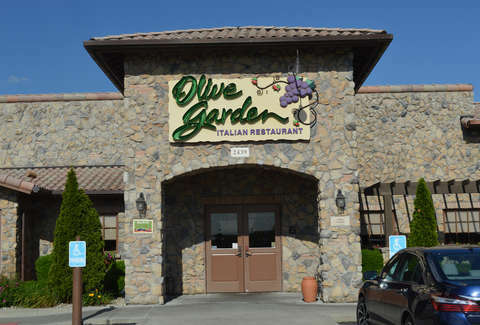 The incident, which you'll be absolutely shocked to learn took place in Florida, occurred just outside an Olive Garden in Naples, where police were dispatched to deal with a man who was allegedly disturbing customers, according to The Miami Herald. When cops arrived they found the man shirtless on a bench, "shoveling spaghetti into his mouth with his hands" and reeking of booze, per a police report from the Naples Police Department. The employee who made the call to authorities said the man had been asking patrons for money and yelling expletives outside the restaurant, then came inside and began to cause a scene. Cops tried asking the man, now identified as Ben Padgett, what he was doing on the bench, but arrested him for disorderly intoxication after he responded by muttering obscenities. As the Herald so wonderfully points out, they offered him some paper towels to clean the pasta off his face before they cuffed him. Once in the back of the squad car, Padgett allegedly continued to cause a commotion and flailed around so hard he smashed his head against the partition and had to be treated at a hospital. He was later transferred to a local jail and also charged with resisting an officer. To be fair, we'd be pretty upset too if we were forced to leave Olive Garden without getting the chance to house some unlimited breadsticks.